Kale is basking in the glow of its more than 15 minutes of fame. From kale chips to kale salads, this delicious, versatile leafy green will quickly become part of your permanent grocery list. Kale is one of the best sources of vitamin K, an excellent source of vitamins A and C and home to a host of antioxidants. Some research has shown that kale may help prevent cancer and reduce inflammation. It is also a good source of fiber, which has generally been shown to help lower cholesterol. Ready to buy this superfood? It’s in season from mid-winter until early spring, though you can usually find it year-round. Look for brightly colored leaves and stems without blemishes, and store in an airtight bag for 5-7 days in the fridge. When you’re ready to use it simply rinse, remove the stems and chop. Try both varieties, the curly variety and the flat leaf type referred to as Tusacn, lacinto or dinosaur kale. 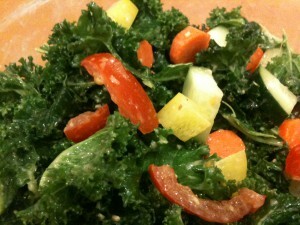 One of my favorite kale salads is the Weekend Glow Kale Salad from Angela at Oh She Glows. The lemon-tahini dressing is addicting, and quite delicious drizzled over salmon. Another favorite is from my friend Anja at One Bite Rule. It’s also easy to make your own kale salad – remove the stems, chop the kale, use your hands to massage the dressing into the leaves and then let them sit for 10-15 minutes before adding the rest of your ingredients. A knife-less tip to remove the leaves from the curly variety – hold the leaves in one hand, the stem in the other, and pull. What’s your favorite way to eat kale? 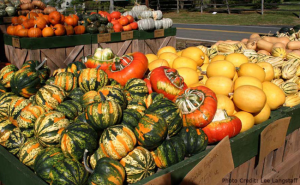 This squash is delicious pureed as a soup or simply baked in the oven. To bake, cut the squash into 1 inch cubes and toss with olive oil, salt and pepper, then place on parchment paper and bake at 350 degrees for ~20 minutes. Turn after 10 minutes and test with a fork for tenderness. No time to chop? Butternut squash is commonly found pre-cut at your local grocery store. Simple and comforting, this is the perfect squash for multitasking with dinner prep. Simply cut it in half, remove the seeds, rub the cut side with olive oil and place cut-side down on a baking dish lined with parchment paper. Bake at 350 degrees for 30 minutes, then turn, rub the cut side with 1/4 tablespoon of butter and sprinkle with cinnamon and brown sugar. Bake for another 15 minutes or until the squash is fork-tender. You’ll have at least 45 minutes to prep dinner while the squash is in the oven! Whether you’re making pie, pumpkin butter or simply carving one for Halloween, the benefits of pumpkins don’t end with the flesh. You can easily roast the seeds for a delicious snack! Simply rinse off the pulp, arrange in a single layer on a baking sheet, and lightly coat with olive oil or a non-stick cooking spray and a touch of salt. Place in a 325 degree oven for 20-25 minutes. Stir after 10 minutes and check every 5 minutes past 20 minutes. Let them cool and store in an airtight container. Along with flavoring your food, garlic can also confer multiple benefits on your health. It has been linked to a reduced risk of colo-rectal cancer and has shown protection against heart disease. Garlic is a member of the Allium sativum family, which includes onions, shallots, leeks and chives. It is one of the oldest cultivated plants and has origins in Southeast Asia. The active components in garlic are sulfur containing compounds, including thiosulfinates (i.e. allicin), sulfoxides (i.e. alliin) and dithiines, but the most important component is the sulfur itself. Garlic also has high levels of selenium (which may help reduce the risk of cancer), manganese (helps maintain bone health, regulate blood sugar and synthesize fatty acids and cholesterol) and Vitamins B6 and C. This article from the New York Times illustrates the sulfur compounds as defense mechanisms for allium vegetables, given their pungent odor and flavor. The benefits of the sulfur containing compounds are most readily available when the garlic is peeled and chopped and left to sit out for 15-20 minutes before cooking. Heating unpeeled cloves will deactivate the enzyme. Results from research studies show an inverse relationship between the amount of fresh/cooked garlic consumed and levels of colorectal cancer (more garlic = less cancer). The studies did not look at powdered garlic or garlic supplements, which do not show the same benefits as fresh cloves. The cardio-protective benefits of cancer include reduced cholesterol, lower blood pressure and lower risk for blood clots. It is believed that these benefits are derived from both the sulfur compounds and the anti-inflammatory mechanisms in garlic. Garlic can help prevent damage from oxidation, which in turn contributes to inflammation, and both of these processes contribute to heart disease. Vitamin C prevents oxidation, as does vitamin B6, which helps lower levels of damaging homocysteine. Selenium works with your body to produce an anti-inflammatory called glutathione peroxidase. With all of these health benefits and no discovered adverse side effects of eating garlic, it’s an easy way to keep your body healthy. 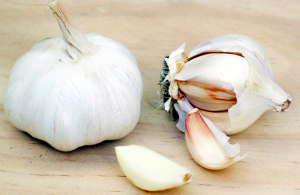 Simply add garlic to soup, a stir fry, salad dressing, sauce and pasta, meat, poultry, fish and shellfish dishes. It is also delicious cut in half, drizzled with olive oil and roasted in the oven. Today is week 7 of Summerfest, and you can find a list of blogs with inspiring garlic recipes at A Way to Garden. With fall just around the corner it’s the perfect time to try something new! Looking for a new way to refuel after an outdoor summer workout? Try coconut water! It’s commonly found in supermarkets and health food stores alike. 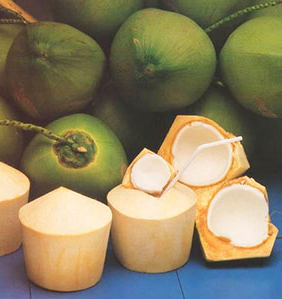 Coconut water is the “water” found inside young green coconuts, which will later develop into the white coconut “meat”. Coconut milk is a higher calorie (yet still delicious) creamy liquid derived from squeezing the meat of mature coconuts. One cup of plain coconut water contains ~60 calories, no fat or cholesterol, and is a good source of the electrolytes magnesium and potassium (1 cup of some brands contains more potassium then a banana!). Most brands also contain vitamin C and trace amounts of sodium. You may see coconut water in mango, passion fruit and pomegranate flavors (just to name a few), so check the label of your favorite brand to see exactly what you’re drinking. If you’re looking to add some tropical flair to your next meal, try mixing coconut water into your cooking water for rice, add it to a smoothie, or use it in a dessert!